A regular breeding resident and migrant, the Chimney Swift was an uncommon species during the Minnesota Breeding Bird Atlas (MNBBA). Distributed across the eastern half of the United States and southeastern Canada; populations occur west as far as the eastern Great Plains states and southeastern Saskatchewan. The species is most abundant in the north-central and southeastern states (Figure 1). Assigned a Continental Concern Score of 13/20 and designated a Common Bird in Steep Decline by Partners in Flight; also designated a Species in Greatest Conservation Need by the Minnesota Department of Natural Resources. A long-distance migrant that spends winters in northwestern South America. Breeding distribution and relative abundance of the Chimney Swift in North America based on the federal Breeding Bird Survey, 2011–2015 (Sauer et al. 2017). Often referred to as a “flying cigar,” the Chimney Swift was considered by Roberts (1932) to be an abundant summer resident throughout much of Minnesota in the early 1900s. The one exception was the large, open stretches of prairie grasslands where trees and farmsteads were absent. The species could be found nesting in hollow trees in the old-growth forests and dilapidated cabins of northern Minnesota, and in chimneys and old farm buildings in southern Minnesota. Confirmed nesting records (nests with eggs or young) were available from 4 counties, including Hennepin and Sherburne Counties in the east-central region, and Cass and Cook Counties in the north. A few years later, Janssen (1987) specifically commented on the species’ rarity in the northwest region of the state. Despite its broad statewide distribution, nesting had been confirmed in only 5 counties since 1970: Aitkin, Clearwater, Hennepin, Morrison, and Rice. Hertzel and Janssen (1998) later identified 6 counties where nesting had been confirmed since 1970; Clearwater County was not included on their map, but Kandiyohi and Watonwan Counties were added. As of 2014, biologists with the Minnesota Biological Survey had documented 168 breeding season locations for the species. Sparsely distributed throughout the state, records were most abundant in southern Minnesota but were again noticeably absent from the northwestern counties (Minnesota Department of Natural Resources 2016). During the MNBBA, participants reported a total of 836 Chimney Swift records from 12.8% (612/4,774) of the surveyed atlas blocks and from 15.0% (351/2,337) of the priority blocks. Breeding evidence was gathered in 82 (1.7%) of the surveyed blocks (Figures 2 and 3; Table 1). Despite the relatively small number of records, the birds were observed in all but 1 of Minnesota’s counties (Isanti) and were confirmed breeding in 42 counties. Two blocks where nesting was confirmed each straddled 2 counties along the Minnesota River (Renville/Redwood and Nicollet/Brown). All but 5 counties were additions to Hertzel and Janssen’s 1998 list. As expected, the largest number of nesting records was from the Twin Cities metropolitan area. The land suitability model generated for the Chimney Swift emphasizes the species’ strong association with developed communities that provide nesting chimneys (Figure 4). The major change in the nearly 100 years since Roberts wrote his account of the species in 1932 is the sparse but widespread occurrence of the species throughout the agricultural regions of the state, from southern Minnesota north through the Red River valley and aspen parklands. The small towns and cities that dot the landscape now provide more man-made opportunities for nesting. The westward expansion observed in Minnesota has been witnessed elsewhere in the Great Plains. During South Dakota’s second atlas (2009–2012), for example, more Chimney Swifts were observed in small towns west of the Missouri River than during the first atlas (1988–1992) (Drilling et al. 2016). A small population even became established in southern California, far from the nearest nesting populations in eastern New Mexico and Colorado (Steeves et al. 2014). In contrast, both Ontario and Michigan witnessed an overall decline in observations between their first and second atlases, and a southern retraction of breeding populations (Cadman et al. 2007; Chartier et al. 2013). Breeding distribution of the Chimney Swift in Minnesota based on the Breeding Bird Atlas (2009 – 2013). Summary statistics of observations by breeding status category for the Chimney Swift in Minnesota based on all blocks (each 5 km x 5 km) surveyed during the Breeding Bird Atlas (2009-2013). Summary statistics for the Chimney Swift observations by breeding status category for all blocks and priority blocks (each 5 km x 5 km) surveyed during the Minnesota Breeding Bird Atlas (2009-2013). Landcover suitability of the Chimney Swift in Minnesota based on habitat, landscape context, and climate data gathered during the Minnesota Breeding Bird Atlas (2009-2013) using the MaxEnt modeling approach. Although hollow trees or old tree cavities may still be used for nesting where extensive old-growth or mature forest landscapes remain, chimneys in towns, cities, and small settlements have become the species’ preferred breeding habitat (Figure 5). Chimneys were adopted as alternate nesting and roosting sites as early as the late 1600s and have been used almost exclusively in most regions since the late 1700s (Steeves et al. 2014). Habitat data collected at MNBBA point counts where Chimney Swifts were detected also clearly demonstrate the species’ reliance on developed communities (Figure 6). Few studies have quantified habitat features important to Chimney Swifts, but the availability of suitable nesting and roosting sites appears to far outweigh the importance of any other features. When chimneys are in short supply, other building structures may be used, including open wells, abandoned buildings, and air vents. Overall, darkness and shelter are the primary features characterizing selected sites. Foraging occurs in a variety of different habitats, sometimes several kilometers (3–6 km) from the nest site (Steeves et al. 2014). Typical breeding habitat of the Chimney Swift in Minnesota (© Gerald J. Niemi). Habitat profile for the Chimney Swift based on habitats within 200 m of point counts where the species was present during the Minnesota Breeding Bird Atlas (2009-2013). Using data collected by the federal Breeding Bird Survey (BBS), biologists have estimated the size of the Chimney Swift population in North America to be 7.7 million birds (Rosenberg et al. 2016). In 2013, Partners in Flight estimated that Minnesota supported 1.2% of the North American population, which places the current statewide estimate at approximately 92,000 birds (Partners in Flight Science Committee 2013). Near the northwestern periphery of its breeding range, Minnesota’s population of Chimney Swifts is relatively low compared to regions farther to the south and east (Figure 1). Volunteers conducting BBS routes in Minnesota observe an average of 1 to 2 Chimney Swifts per route each year. This compares with an average of more than 20 birds per route in nine eastern and southern states, including Alabama (23 birds per route), Georgia (25 birds per route), and Kentucky (26 birds per route) (Sauer et al. 2017). In Minnesota, during a long-term study of forest birds on the national forests, an average of only 0.26 swifts were observed on 100-10 minute unlimited distance point counts from 1991 to 2010 on the Chippewa National Forest; on the Superior National Forest an average of just 0.09 birds were recorded (Niemi et al. 2016). Although it would seem that chimneys are in plentiful supply, the long-term population trend for Chimney Swifts is not positive. Since the BBS began in 1966, Chimney Swifts have been declining throughout North America at a rate of 2.50% per year (Sauer et al. 2017). The decline is widespread throughout the species’ range. Overall since 1970, biologists estimate that the continental population has declined by 67% (Rosenberg et al. 2016). 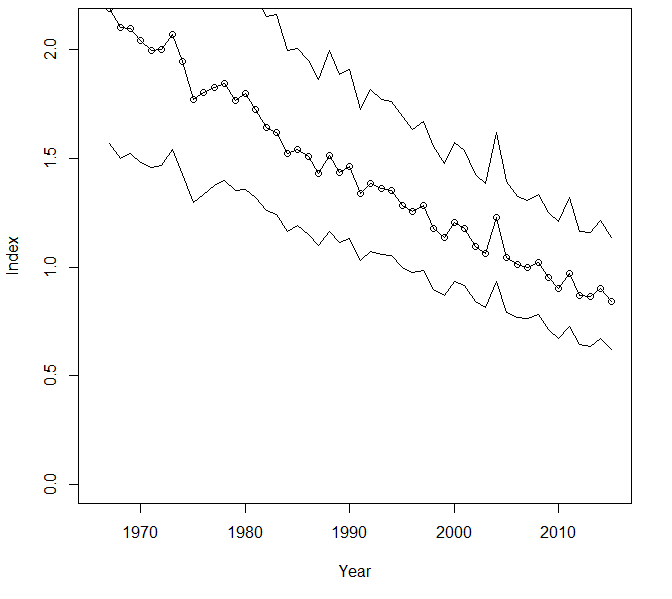 Minnesota demonstrates a similar, albeit slower, significant rate of decline of 1.97% per year since 1967 (Figure 7). Only one state, North Dakota, has demonstrated a significant population increase in all these years. The increase is most evident in the past 15 to 20 years, when oil development exploded in the state, spurring huge gains in the economy and the growth of local communities. Undoubtedly Chimney Swifts are among a suite of species that benefited from the large-scale landscape changes that followed the clearing of eastern deciduous forests by European settlers. Given the unabated growth in industrial and urban development in the United States, the swift’s population decline is, at first glance, a surprise. Some have attributed the decline to a notable decrease in the availability of chimneys. Home and business owners are increasingly capping or caging the tops of old masonry or clay flue-tile chimneys, making them unavailable to swifts and other wildlife that occasionally enter and are unwanted. As new homes are built, open brick and stone chimneys are being replaced with insulated, sheet metal flues for furnaces and fireplaces that are too narrow for swifts to use (Steeves et al. 2014). In some northern regions, logging has reduced the amount of mature forest available, which has likely impacted swift populations that still nest in old, decadent tree cavities and hollows (Steeves et al. 2014). Despite these concerns, a few recent studies in Ontario, North Carolina, and Connecticut concluded that there are more chimneys available than are actually being used by swifts, suggesting that other factors may be at the root of the species’ decline. Another potential concern is the species’ strict dependence on flying insects. Attention has recently focused on the entire suite of aerial insectivores. Nebel and his colleagues (2010) pointed out that all aerial insectivores have declined at a much faster pace than any other guild of passerine birds. The authors noted that the declines were most prevalent in the northeastern United States, where human population density and industrialization is highest. They postulate that the resulting increase in atmospheric pollutants and their negative impact on aerial insects may be a strong factor in causing the declines of aerial insectivores. Another intriguing study gathered evidence from guano deposits accumulated over five decades at a major Chimney Swift roost site in Ontario. The guano essentially served as an archive of the swift’s diet over time, preserving the exoskeletons of the arthropods swifts were consuming. Examination of the deposits suggested that the widespread use of DDT in the 1940s and early 1950s changed the abundance and composition of flying insects, which, in turn, changed the swift’s diet (Nocera et al. 2012). Even though DDT is no longer an environmental stressor, Chimney Swift populations have continued to decline. Further study is clearly needed to fully understand the scope of factors affecting Chimney Swift populations and their long-term sustainability. Breeding population trend for the Chimney Swift in Minnesota for 1967–2015 based on the federal Breeding Bird Survey (Sauer et al 2017). Although the Chimney Swift remains a widespread and relatively common species, its long-term population decline prompted its designation as a Common Bird in Steep Decline by Partners in Flight (Rosenberg et al. 2016) and the assignment of a Continental Concern Score of 13/20 (Partners in Flight 2017). Its decline also prompted its designation as a Species in Greatest Conservation Need in Minnesota (Minnesota Department of Natural Resources 2015). The potential impacts of climate change on this species are not well known, but a report in 2010 rated it as being moderately vulnerable (North American Bird Conservation Initiative 2010). Chimney Swift enthusiasts concerned about the species’ future have launched the Chimney Swift Conservation Association (www.chimneyswifts.org) dedicated to promoting the species’ conservation through public education, preservation of existing habitat, and creation of new nesting and roosting sites. Two of their most popular projects have been to monitor the species’ numbers at significant roost sites late each summer and to promote the construction of nesting towers. Many other organizations have rallied behind these initiatives, including Audubon Minnesota. For several years, they have sponsored an Annual Chimney Swift Sit, which is conducted on two designated weeks in late July and late August, when volunteers count swifts as they enter nighttime roosts prior to their southward migration. In 2015, for example, 186 observers counted a total of 13,751 swifts in 28 cities across Minnesota (Audubon Minnesota 2015). 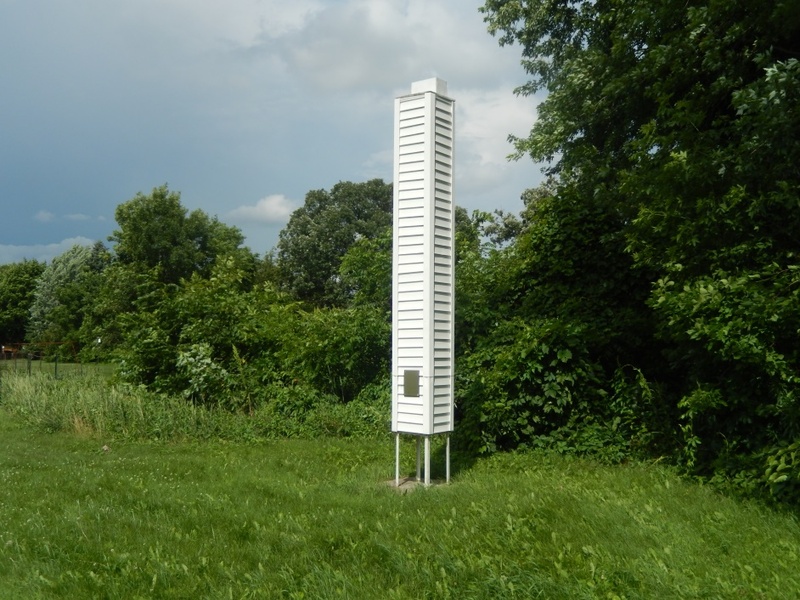 For years Audubon Minnesota also actively worked with volunteers and local civic groups to build and erect swift nesting towers (Figure 8). A total of 68 towers have now been constructed in the greater Twin Cities metropolitan area and in several outstate locations (Audubon Minnesota 2016). Unfortunately the use of these towers elsewhere in North America has had mixed success, particularly in the northern regions of the species’ range. Low residency rates may reflect inappropriate design features or the fact that chimneys are not the limiting resource for local populations (Steeves et al. 2014). Towers erected in Minnesota have not been regularly monitored, so their ability to attract local nesting pairs is unknown. Much remains to be learned about Chimney Swifts and the factors responsible for their decline. In the interim, public education regarding the value of retaining existing chimneys is critical for sustaining local populations. Education needs to be directed not only to home and building owners but also to chimney sweep companies, who frequently are called upon to cap chimneys, making them unavailable to nesting and roosting birds. Chimney Swift nesting Tower (© Lee A. Pfannmuller). Nocera, Joseph J., Jules M. Blais, David V. Beresford, Leah K. Finity, Christopher Grooms, Lynda E. Kimpe, Kurt Kyser, Neal Michelutti, Matthew W. Reudink, and John P. Smol. 2012. “Historical Pesticide Applications Coincided with an Altered Diet of Aerially Foraging Insectivorous Chimney Swifts.” Proceedings of the Royal Society B: Biological Sciences 279: 3114–3120.